Well, I’m convinced now. I thought he was good last year, but he really has his act together this year. I said last week he could jump into the top spot with an impressive performance, but this far exceeded what I was expecting. I loved the way he looked in the post parade, I loved his race, and I loved the way he came prancing back on his toes as if he hadn’t even run. His closing fractions of :23 1/5, :23 2/5, and :06 flat made him virtually unbeatable, and he did it in hand. He looks like this year’s PRM (Perfect Racing Machine). You could see he was in the zone in the post parade -- muscled up with his neck arched. He is the consummate professional, as one can see by the way he just sits comfortably behind horses even stuck down on the rail, and then turns it on at the right time without being asked. He can beat you on the outside, inside or between horses and he can move early or late. Even though he did absolutely nothing wrong last year, he’s much more brilliant and polished this year. I mentioned earlier about his incredible demeanor in the sales ring (See youTube), and assistant trainer Trish McLaughlin said he is by far the quietist and classiest Tapit she has ever been around, and watching him breeze is a “Wow” every time. I think we know now why they spent $2.2 million for him. We tend to embrace Cinderella stories like California Chrome, but we all love Downton Abbey, so we do have a place in our heart for aristocracy. There is absolutely no reason to be down on him. He ran a terrific race in the Holy Bull, being too sharp and taken out of his comfort zone. And he was giving 2 lbs. to Mohaymen. When you’re battling on the lead, going against your running style, and come home in :23 2/5, :23 3/5, and :06 2/5, you’re going to win 9 out of 10 times. He went into the race off three slow breezes and without a work to take the edge off, he simply may have been a bit too fresh. He should get a lot out of this race returning to his best running style. This is a horse who wants to sit back and close, as he did in the Champagne with an explosive stretch kick that decimated his field, including Saturday’s Withers winner Sunny Ridge. Needless to say I was surprised to see him on the lead even with the lack of pace. And then he had to go head and head with Perfect Saint, who would wind up finishing last, beaten over 18 lengths. He fought back when Mohaymen came up on his inside to stick his head in front and kept trying, despite the rapid closing fractions, finishing 2 1/2 lengths clear of the third horse and 5 1/2 lengths ahead of highly regarded Conquest Big E. The bottom line is that no one was beating Mohaymen on this day. We don’t know how good his full-brother, Algorithms, could have been, but his other two stakes-winning brothers (Justin Phillip and Keyed Entry, by speed-oriented sires) were a sprinter and a miler, so he really needs to be taken back off the pace and give that Bernardini blood a chance to kick in. He looked great physically in the post parade and this should be a good learning experience and help move him forward. Continues to work steadily, breezing a half in :49 2/5. 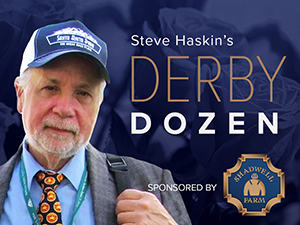 As of now the Derby gods seem primed and ready to present the blanket of roses to Kiaran McLaughlin, but it won’t take much to put Romans back in the hunt, even though he has some waiting to do before his big guns get going in earnest. This colt remains his main hope. He has the class, the turn of foot, and a dynamite knockout punch. We all know that his sire Giant’s Causeway is a stakes producing machine, but few know about his broodmare sire Sahm. He won the grade II Knickerbocker Handicap, but his main asset is being out of the mare Salsabil, who became the first filly in 90 years to win the Irish Derby. Brody’s Cause is inbred to English Derby winner Roberto. His dam, Sweet Breanna, was stakes-placed in Canada, including the Woodbine Oaks, and his second dam. Sweet Roberta, won the Selima on grass and finished second in the Breeders’ Cup Juvenile Fillies. So, while there is an abundance of grass in his pedigree, there is enough dirt, and he’s already proven himself to be a top-quality dirt horse. Breezed a slow 6 furlongs in 1:16 1/5, but came home his final eighth in :11 4/5, and I’d rather see him work like this than turn in short fast works. We already know he has speed and can carry it two turns. He’s scheduled to debut in the 7f San Vicente, so that will be his sharpener. He doesn’t need to work fast for a sprint that is not necessary to win. The only thing that’s important on the Derby trail is getting to the Derby the right way and not trying to keep an unbeaten streak going. You can’t be afraid to lose. The last thing this colt needs is to get speed crazy. Also, O’Neill has been having him gallop long before breaking off into his works and obviously is concentrating on building up his stamina. I’d still prefer to see him race twice at two turns after the San Vicente. O’Neill knows his horses as well as anyone and knows how to prepare lightly raced horses for a big race (See I’ll Have Another), but he’ll have to be at his very best if he expects to get this colt a mile and a quarter off only one two-turn race followed by a 5-week layoff. It’s certainly not the traditional way of preparing a horse for the Derby, so we’ll see if he can pull this off. Love the way he’s been working, and his last, 5f in 1:00 1/5, the second fastest of 32 works at the distance, was excellent. But supposedly he came out of it with a minor respiratory issue and will now likely point for the Risen Star Stakes for his 3-year-old debut. His stablemate, Conquest Big E, was a big disappointment in the Holy Bull, so Airoforce looks to be the Casses main Derby hope as of now. He just needs to show it on a fast track. As we’ve mentioned, the form of the Kentucky Jockey Club Stakes has more than held up, with the subsequent success of Mor Spirit and Mo Tom in graded stakes, and this colt blew them away with a powerful stretch kick in his dirt debut. And let’s not forget about his huge effort in the Breeders’ Cup Juvenile Turf, when he unleashed another big stretch run, only to get nipped on the wire by the European Hit It a Bomb, who came from the clouds. He gets stamina from his sire and his tail-female family, but his broodmare sire is pure sprinting speed. Anyone know if Cuvee has sired any distance horses in Turkey? Can’t wait to see if this colt has the same closing punch going 1 1/8 miles on a fast track. If he does, I would imagine Colonel John, Tiznow, and With Approval will get him that extra eighth. Looking for a big effort when he returns in the 7f San Vicente Stakes against Nyquist. Again, he doesn’t need to win, just be running hard at the wire. Two different training approaches, as he blazed 5f in a bullet :58 1/5. This is a colt still looking for an identity. He hasn’t shown a great deal of early speed and hasn’t demonstrated a big closing kick except for his maiden score at 6f; he just manages to be there at the finish. Nothing wrong with that. Sunny Ridge’s victory in Saturday’s Withers Stakes boosts his reputation and every little bit helps. Bottom line is he’s as honest as they come, at all distances and all tracks, and you can count on him being right there in the stretch and at the wire. We just don’t know yet if he has what it takes to beat the heavy hitters. The San Vicente could be a good starting point. Love Curlin and love Vindication, and his tail-female family traces to English and Irish Derby winner The Minstrel and Belmont Stakes runner-up, the Graustark stallion Ruritania, owned and bred by Greentree Stud. So there is plenty of classic blood on both sides of his pedigree. Continues to to work well for the Feb. 6 Robert B. Lewis Stakes, breezing 5 furlongs in 1:00 2/5. We really have no idea how good the Southern California-based horses are this year, especially with two of the top Derby contenders slated to debut in the 7f San Vicente. That leaves the Robert Lewis open for several of the late developers looking to stretch out for the first time. As mentioned, Toews on Ice, who he defeated in the Los Alamitos Futurity, ran a disappointing race when shipped to Oaklawn for the Smarty Jones Stakes. What this ridgling has going for him is his ability to race near or well off the pace, and with his big long stride he has an effortless way of moving. Baffert also has the first two finishers of the Sham Stakes, Collected and the fast-closing Lets Meet in Rio, as well as the exciting, but lightly raced Drefong, so he has several options. But right now, Mor Spirit is definitely his big Derby horse, especially with his versatility and ability to keep coming at you in a steady relentless manner. After California Chrome, do you really want to dismiss a Cal-bred who is undefeated in six starts, five of them stakes, at five different distances from 5f to 1 1/16 miles, and won his first two-turn race, the Cal Cup Derby, like he was out for an afternoon stroll? And this was coming off a 3-month layoff. Can’t wait for him to face open company, which likely will be the San Felipe Stakes. This colt is not as smooth and polished as California Chrome, and thank goodness he finally learned to change leads in the Cal Cup Derby, which he won by 8 1/2 lengths while under cruise control, and throwing his ears around the entire race. He was a little awkward heading into the first turn, with his head turned to the inside. but he quickly settled into a nice stride on an uncontested lead and then just opened up at will. Although he did switch leads this time, he needed help from Victor Espinoza, who else? He also has to learn to drop his head after turning for home, although he did lower it as he got closer to the wire. So there are still some kinks to work out, but there is no doubting this horse’s ability. We just need to see that ability against top-class horses. I’ve been waiting to put this colt in the Top 12 and this looks as good a time to experiment as any with things in limbo. I like the way he won his last three races, showing he’s a very tough horse to get by. When he won the James Lewis at Laurel, his time of 1:09 67 was only two-fifths slower than the Frank DeFrancis on the same card, featuring top-class older sprinters Gentlemen’s Bet and Palace. He easily handled Vorticity in his maiden score and Vorticity has come back to win the Marylander and finish second in the Jerome and Withers Stakes. Stretching out to a mile, Awesome Speed won the Mucho Macho Man Stakes in a sharp 1:35 4/5 after getting bumped into another horse at the start and rushing up into contention before settling into stride just off the leader. He’s a beautiful mover, and no matter how much he’s under pressure in the stretch, he doesn’t need the whip and won the Mucho Macho Man with his ears pricked, galloping out strong past the wire. Finally, you have to love the fact that he has such brilliant speed, despite being bred strictly for stamina top and bottom. And here’s the topper. His great granddam, Great Finesse, was featured in the book “Chicken Soup for the Horse Lover’s Soul.” She became blind due to progressive eye disease and learned to place her head on her handlers’ shoulders and arm and use them as her guide, as a blind person would a guide dog. She learned to follow them by touch. Because they were afraid to buddy her up with another mare they got her a llama as a companion. Her foals would have a bell put around their neck and she became a wonderful mother caring for them. From 1983 to 2001, she produced 12 foals, and six of her seven foals to race earned over $150,000, averaging 43 starts. Now she could have a great grandson in the Kentucky Derby, who has inherited her class, courage, and great mind. Turned in a solid half-mile breeze in :48 1/5 as he prepares for the Risen Star Stakes. There is no doubting this colt’s powerful stretch kick and he’s shown he can come flying on the far outside or along the rail. His LeComte was a big step forward, as he ran a much more professional race than in the Kentucky Jockey Club. He actually runs contrary to his pedigree, with the brilliant Uncle Mo and the late-running sprinter Rubiano. Perhaps it is that Nijinsky and Northern Dancer inbreeding that is allowing him to be effective around two turns. But the question is can he keep turning in those big stretch runs as the distances stretch out, especially to a mile and a quarter? As long as he keeps displaying the same kind of closing kick he did in the Kentucky Jockey Club and LeComte, he’s got a shot to be a force on the Derby trail. Tapit—Paiota Falls, by Kris S.
Here we go again with another possible two-week wonder. I'm banking on him running big in the Feb. 13 Sam F. Davis Stakes, based on his works and his most recent victory in the Smooth Air Stakes. I'm ignoring his bizarre, ugly race and ride in a Keeneland allowance last year that Motion called a “fiasco.” He has sandwiched that race with victories, including an impressive score going 7 furlongs at Saratoga. In the Smooth Air, he was a completely different horse than the one we saw the race before, doing everything professionally and drawing off to another impressive victory, defeating Fellowship, who confirmed the form of the race by coming back to finish a good third in the Holy Bull Stakes at 40-1. Also, Rafting beat El Charro by 6 lengths in the Smooth Air and El Charro came back to finish second, beaten 1 1/4 lengths by Awesome Speed, in the Mucho Macho Man Stakes. Following a pair of strong 6-furlong drills he breezed 5 furlongs in a bullet 1:00 4/5, fastest of 27 works at the distance, indicating he should be ready for another big effort. His second dam is a full-sister to the great Hall of Famer Dance Smartly. Smart move by Romans skipping the Holy Bull, but he’ll likely have to face Mohaymen in the Fountain of Youth, unless he hits the road to possibly take advantage of Fair Grounds’ long stretch in the Risen Star Stakes. Keeping sharp with a 5 furlong work in 1:00 4/5 at Gulfstream. Normally, I’m apprehensive about getting too high on big allowance winners who have not shown any speed, especially after six races, and this colt needs to get faster if he’s going to be competitive with the top horses. But I’m going basically by his turn of foot and his ability to burst clear of his opponents, and the fact that he’s showing such dramatic improvement. We have no idea at this point what his ceiling might be. The big question is whether he can do that against quality horses when it’s going to take some sharp speed figures to win or place in graded stakes. So for now I’ll go by the visuals of his last two and the fact that he’s trained by Romans. But he could very well fall off the list as others come along with big efforts in stakes. I’ll try to keep him on as long as possible. We just have to wait until he runs again to be more conclusive about him. It’s hard to get a line on the Withers Stakes results. It seemed pretty obvious that the track was on the slow side. At least it better have been if any of these horses have any hope of being a major Derby contender, as they all were struggling pretty good down the stretch, running the 1 1/16 miles in a tick under 1:47 and coming home in nearly :07 seconds. SUNNY RIDGE confirmed that he is one of the most consistent 3-year-olds in training and gives 100 percent every time, and this was an excellent debut under the circumstances, in which he was under pressure every step of the way, battling with a talented horse in VORTICITY. He’s not exactly bred to relish a mile and a quarter, but we’ll see how far he goes as the distances stretch out. I wasn’t thrilled to hear trainer Jason Servis say he’ll probably be pointed for the Gotham and/or the Wood Memorial. I like the “and,” but certainly not the “or,” if he runs in the Gotham and that’s it. I don’t see him as a Derby threat with just this race the Gotham, never having been farther than 1 1/16 miles and a two-month layoff to the Derby. As for the 1-2 favorite, FLEXIBILITY, his flat performance was not a shock, with this being his fifth start in only 3 1/2 months, including a 1 1/8-mile race and two tough battles with Mohaymen. I was surprised to see him in the Jerome a month after chasing Mohaymen at 1 1/8 miles. But after he won that with authority, I thought for sure he’d be given some time off and point for the Gotham, but he came right back with his second start in January. Chad Brown knows his horse better than I do, so it’s not a criticism, just a surprise. He didn’t have the clearest of trips, and got bumped a bit in the upper stretch, but this was not the same horse we’ve seen in prior races, as he was unable to out-close ADVENTIST, who had only a single six-furlong maiden race under him, for third. Perhaps a slow and possibly demanding track (they came home the final eighth in almost :13 1/5 in the 6f Toboggan Handicap) under the circumstances was the last thing he needed. It’s way too early to give up on him as a Derby contender, as his two efforts against Mohaymen were excellent, but Brown will have to go back to the drawing board and decide where to go from here. There was great interest in last Friday’s one-mile allowance race at Gulfstream, with all eyes on Shadwell’s exciting SHAGAF, a six-length winner of a mile maiden race at Aqueduct in November and the Todd Pletcher-trained RALLY CRY, who had also broken his maiden impressively going a mile at Gulfstream in December. Although Shagaf won with authority, while Rally Cry ran into a ton of trouble, there were many racing people on Twitter who were not impressed with the victory and spoke more highly of Rally Cry’s third-place finish. There are several ways to look at Shagaf’s two-length score. From a visual standpoint, the son of Bernardini, who reminded me of his sire in overall appearance, looked impressive, stalking a testing pace four-wide and then cruising to the lead on his own on the far turn as if he were going to win by the length of the stretch. He changed leads smoothly and on cue and was doing everything brilliantly until the final furlong when he either started getting tired or just lost focus, having gone to the lead so early in the race. He was kept to task under a steady hand ride, so it’s not that was being eased at the end. So how does one account for fractions of :23 3/5, :23 1/5, :23 4/5, and :26 2/5? What happened in the final furlong that allowed 36-1 SOUTHSIDE WARRRIOR to cut his lead in half and also allow Rally Cry, who looked to be out of contention, to rally for third? He still had good extension to his stride through the final furlong and was throwing his ears around. Let’s remember, this is a young inexperienced colt who found himself with a clear lead on the far turn, in what looked to be a premature move and had his rider looking back at the quarter pole. At this point, we should give him the benefit of the doubt and assume he simply lost focus and was not tiring, especially since he re-broke right after the wire and opened a good 5 to 6-length advantage on the gallop-out. To all those who may have gotten a bit down on him, this is still a very talented colt who gained a great deal of experience from this race and should run even better next time. After all, he did win by two lengths and looked fantastic turning for home, so let’s not act like this was a disappointing effort. Rally Cry ran a terrific race after getting bumped by the rail horse at the break, then having to alter course to the inside shortly after when pushed in by the horse to his outside. Javier Castellano made a bold move along the rail nearing the half-mile pole and seemed about to stick his head in front when the horse on the lead came in, forcing Castellano to take up. In a flash, Rally Cry was now 6 lengths back and appeared to be out of the race. Despite never changing leads, he still managed to close well to finish third, beaten 4 1/4 lengths. So, although this race was far from definitive, leaving questions about both colts, it did indicate they both have a bright future, and it will be interesting to see how Shagaf performs as he matures and gains more experience. AWESOME BANNER ran another big race to win the 7f Swale Stakes by 5 lengths to remain undefeated in three career starts. Of course, he picked up zero points for his sprint score, but right now he just seems too fast and too dependent on the lead to be considered a Derby horse anyway. He ran the 7f in a sprightly 1:21 4/5, but note that Cathryn Sophia easily won the Forward Stakes the race before in 1:22 flat and came home her final eighth almost a full second faster. Trainer Stanley Gold has no plans for the colt at this time, but he does have a more classic type in his barn in FELLOWSHIP, who ran a big race to finish third in the Holy Bull Stakes at odds of 40-1. The Florida-bred, who like Awesome Banner is by Awesome of Course, was making his eighth start in a stakes race, so you have to give him points for that. On the Pletcher front, he sent out the Uncle Mo colt MO POWER to a workmanlike one-length victory in a one-mile maiden race at Gulfstream, in which he tracked a strong pace (half in :46), took over turning for home, and held off the late closing charge of the Shug McGaughey-trained DOCTOR MOUNTY, a son of Street Sense, out of an A.P. Indy mare, who was making his second career start. The mile was run in a solid 1:36 3/5. Mo Power is a half-brother to grade II Lexington Stakes winner Behindatthebar. ZULU had been ranked No. 12 strictly off his potential with the knowledge he has a lot to prove and a lot of catching up to do. So we have to scrutinize every little thing surrounding him, and that includes not working in the two weeks since his allowance score. Dropping him could very well be unwarranted, but it’s difficult keeping a horse like this on the list too long, as others perform well on the track. If his inactivity on the work tab is by design, that’s fine. But until he shows up again, we’ll just have to keep him in limbo. I still think he could be special. Two of Pletcher’s other Derby hopefuls, the recent wire-to-wire maiden winner GETTYSBURG and DESTIN, worked a bullet half in :47 3/5 breezing in company, fastest of 20 works at the distance. Donnie Von Hemel will run both his Derby hopefuls, SYNCHRONY and SUDDENBREAKINGNEWS in the Feb. 15 Southwest Stakes rather than split them up and send the latter to Fair Grounds for the Risen Star Stakes. Synchrony, who breezed a sharp half in :47 3/5 Jan. 29, is coming a off fast-closing third in the Smarty Jones Stakes, while Suddenbreakingnews was beaten a nose by Smarty Jones winner DISCREETNESS in Remington Park’s Springboard Mile. Also pointing for the Southwest is the John Servis-trained BIRD OF TREY, the Pennsylvania Nursery winner who finished fourth in the Jerome Stakes last time out. Recent allowance winner WHITMORE, breezed 5 furlongs in 1:02 for the Southwest. Another Southwest hopeful on the work tab was allowance winner CUTACORNER, who breezed 5f in 1:01 for Jack Van Berg. One Oaklawn-based horse to drop off the Derby trail was the Steve Hobby-trained KNIGHTS KEY, who will undergo surgery to remove two small “flakes” in his knee. All eyes were on Rachel Alexandra’s brother, DOLPHUS (by Lookin At Lucky), in Sunday’s mile and 70-yard allowance at Fair Grounds, and while he didn’t exactly look like his big sister, he still ran well enough to defeat his three opponents, winning by three-quarters of a length over two promising colts – second-place finisher JENSEN, who ran well stretching out from a 6-furlong maiden victory, and fourth-place finisher (beaten 2 lengths) HARLAN PUNCH, coming off a third in the Delta Jackpot. Joe Sharp trains the winner, while Larry Jones trains, owns, and bred the runner-up. BLUE CREEK, who has been highly touted in Dubai, winning his first two starts with ease for Godolphin, finished second in the one-mile Al Naboodah Cargo Trophy Jan. 30, beaten 1 3/4 lengths by Active Spirit. MALIBU SUNSET is playing major catch-up, but the son of Bernardini was spectacular breaking his maiden by 10 1/2 lengths in 1:10 4/5 for the six furlongs in his career debut at Fair Grounds. This colt just bounds along with long fluid strides and he had this field demolished by the three-sixteenths pole, winning under wraps in the final sixteenth. If only he had gotten started earlier. He is not among the early Triple Crown nominees. Pity the California horses if I WILL SCORE can carry his speed two turns. With the ridiculously fast fractions he’s run in his first two starts (how about :21 flat and :43 1/5? ), trainer Jerry Hollendorfer has been working the son of Roman Ruler longer, with a pair of 6 furlong drills in 1:11 3/5 and 1:12 2/5. Let’s see if he shows up in the Robert Lewis or sticks to sprinting in the San Vicente. GUN RUNNER, a game fourth in the Kentucky Jockey Club Stakes, breezed a sharp 6 furlongs in 1;12 3/5 at Fair Grounds for the Risen Star Stakes. Hopeful Stakes winner RALIS continues to train well for his 3-year-old debut, breezing a half in :48 1/5. Top Canadian 2-year-old RIKER returned to the work tab with a 3 furlong breeze in :36 1/5 at Gulfstream Park.